i've clicked around a couple mx utilities and the only oddity i can confirm is that the "advanced options" button of the usb-live -maker does *not* expand the dialog to reveal additional controls. 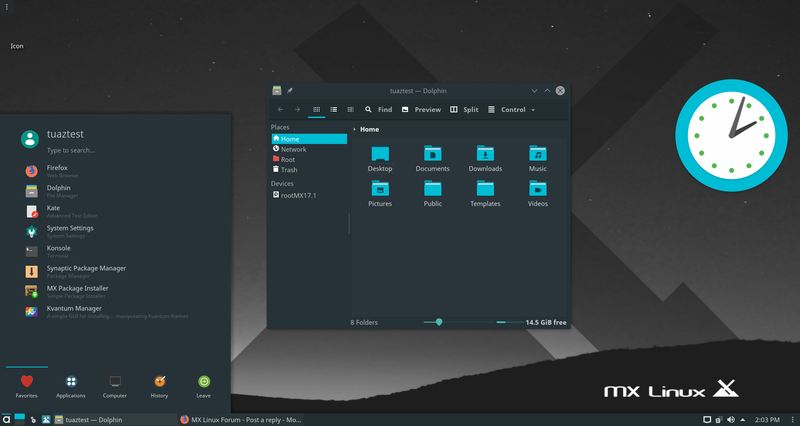 This is with KDE 5.12 (from the neptune repository) on MX17.1 The system is using the regular QT 5.7 libraries from stretch, so i am curious to know if you are seeing the same with plasma 5.8. Anyway, just something i had noticed and thought i'd report. Thanks for those wonderful tools. I figured this out, the text of the advanced options is changed by KDE it adds a & in front of options to make it accessible with Alt-O key shortcut, I guess KDE does that automatically and because the text is changed the text comparison fails. I changed the logic to depend on a flag not on the button text, the update will come shortly. I don't think I use the text from the buttons and other elements in other apps, but if I do I probably have to do the same kind of fix. Regarding the KDE respin, I now have a strange issue with the system/settings fonts in Firefox. Fonts outside of FF are fine, as are the fonts you set to display on the webpages. But the integral parts of the browser itself shows old-school terminal monotype fonts. See screenshot where I"ve captured part of the webpage (nice Noto fonts), Firefox tab, URL bar and menubar fonts (eek! ), and the fonts in the window bar (Noto Sans, from KDE settings). but that was stated to be an Ubuntu bug, not KDE Plasma. On another note, I only just found out (doh!) that the Test Repo contains an update to papirus icons and also a version of Kvantum Manager that has Kvantum's port of Adapta and AdaptaDark themes. Certainly helps to change the look of Plasma, esp if you prefer bolder, cheerier colours. They should be moved to Main repo soon. It will also help to add Adapta Desktop Theme from opendesktop.org, for the panel and widgets. asqwerth wrote: Regarding the KDE respin, I now have a strange issue with the system/settings fonts in Firefox. Fonts outside of FF are fine, as are the fonts you set to display on the webpages. But the integral parts of the browser itself shows old-school terminal monotype fonts. I'm not sure, maybe you should try this... ? Well, that was pretty embarrassing! It was just a simple case of the font settings for gtk apps being set at that old school font. Once I changed it to Noto Sans, following everything else, it was all good. Plasma settings ==> top row of customisation settings, click on the one for "applications"
Then click on the GTK option, you'll see a not-so-obvious entry for fonts just below the theme settings for gtk2 and gtk3. I received the update today and it works fine under 5.12, too. Thank you Adrian. I got only 500 downloads in total, so probably it's not worth constantly maintaining this, but it was easy to do, so maybe I will do that again in a couple of month. If you have the old ISO you probably don't need to download the new ones, but if you want to get the new one, I highly recommend using my zsync_adrian-test.sh script from sourceforge, it should make it easy to download only the difference between the old and new ISO saving time and bandwidth.